And no, Spengler was not referring to the Fed. But he very well could have been, for the Fed certainly fits the definition of a monopolistic middleman, who is the master of money. Which is the subject of Murray Rothbard’s book – The Case Against the Fed. After this blistering opening, Rothbard moves on to discuss how money and banking developed. This discussion segues naturally into the ‘optimum amount of money.’ And as Rothbard demonstrates, “any quantity of money in society is ‘optimal.’” Increasing the supply of money in a society is unnecessary and not beneficial. Any increase that occurs is purely and simply inflation, which, in Rothbard’s opinion, is tantamount to counterfeiting. Counterfeiting increases the money supply, which simultaneously pushes up the cost of goods and services and decreases the buying power of money. The other thing counterfeiting does – and this is an important point – is put more money into the “hands of the counterfeiters.” In other words, the people printing the counterfeit money get richer. Rothbard points out that historically, there “have been two kinds of legalized counterfeiting.” The first is government printed paper money. The second is “fractional-reserve banking.” And Rothbard’s explanation of fractional-reserve banking is one of the best around. For it is simple and clear, eschewing technical jargon and convoluted models. From there, Rothbard moves on to Central Banking, providing a brief history of how and where the concept came from. Modern Central Banking came into existence with the Peel Act of 1844, which gave the Bank of England an “absolute monopoly on the issue of all bank notes in England.” Rothbard illustrates how the Central Bank increases its reserves and those of its cartel members – by buying assets which are paid for by money pulled out of the air. This fiat money expands many times, making all the banks rich. As the reader makes his way through Rothbard’s explanation, he is torn between admiration and shock. On the one hand, such audacity has to be admired. What a simple and effective way to get rich – by making something (money) out of nothing. On the other hand, it is shocking that such trickery is condoned. The Morgan and Rockefeller groups began manipulating the situation politically, and – eventually – the Federal Reserve System came into being “at the plush Jekyll Island retreat.” The year was 1911. In 1913, the Federal Reserve Act was passed. The big bankers got their way. They had a “lender of last resort,” which was code for a Sugar Daddy who would allow them to inflate the money supply. In effect, the Morgan banking group was now running the monetary system of the U.S. Later, as a result of the New Deal, the Rockefellers took over, according to Rothbard. In the final section of The Case Against the Fed, Rothbard describes how the Federal Reserve System methodically pyramids “credits and deposits on top of their initial burst of reserves.” And anyone who bothers to read Rothbard’s lucid explanation is forced to conclude that the Fed does as it pleases. And what it pleases to do is inflate the money supply. Rothbard’s answer to the whole fiasco is simple: “return to gold and to abolish the Federal Reserve, and to do so at one stroke.” All that is lacking is the will to do so. 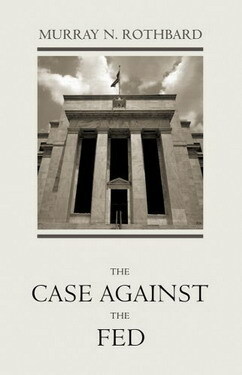 The Case Against the Fed makes a cogent and irrefutable argument for the dissolution of the Federal Reserve System. Rothbard’s writing style is contemporary and easy-to-digest. His mastery of the subject matter is obvious. His illustrations are logical and rational. His recommendations are sensible. One can only hope his words do not fall upon deaf ears.